Startupbootcamp is a 3-month accelerator program that aims to give startups exposure to key players in their industry, while connecting them to a community of top-level mentors and advisors. 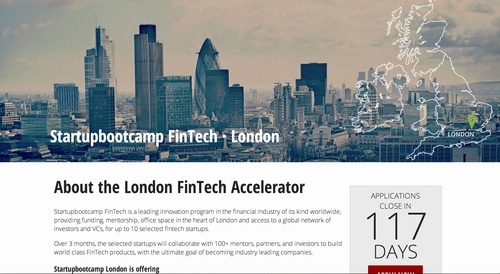 The organization recently launched a FinTech-exclusive accelerator in London, which will begin August 11. It is accepting applications from startups now through June 22, but the earlier you apply, the better chances you have to get into the program. Startupbootcamp’s other programs have so far proven their worth. In fact, over 70% of participating startups have gone on to receive funding. Istanbul serves as a hub for startups in the Middle East and North Africa regions. Israel is focused on startups within internet and mobile technology. Amsterdam focuses on intensive mentoring from industry leaders across Europe and beyond to bolster their funding. Copenhagen works primarily with startups focusing on mobile devices and related technologies and solutions. Berlin helps entrepreneurs launch their business ideas into the global market. Another Amsterdam-located accelerator focuses on innovative solutions based on Near Field Communications and Contactless Interactions Technologies. Eindhoven’s HighTechXL is the fastest way to accelerate your tech ideas-in-progress.